A new guest post from Cluedo! Find her others here, here , here and here. I’d like to propose a new unit of time decay just like carbon dating, with at least the same level of accuracy, but with the added advantage that humans can release as much radioactivity into the atmosphere as they want without distorting the results. 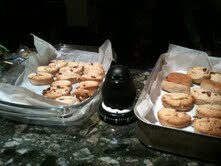 This RHKD seems an adequate measure to guage the popularity of biscuits in my house. Preliminary empirical data gathering seems to suggest that 45 Hussarenkrapferl last circa 24 hours, among 5 flatmates here, which would be a formula of t/n/g, where t is the length of time in hours the portions last, n stands for the number of biscuits, and g for the number of greedy buggers who gobble them all up without leaving me some gourmands who have access to them. On an inverse scale then, the closer RHKD is to zero, the more delicious the biscuit. The current RHKD for Hussarenkrapferl in my abode is therefore 0.10. All of this highly scientific discussion of rates of decay is necessary to highlight one of the key problems with the recipe that I made from the very strange book that is the Kitchen Garden Cook Book by Audrey Ellis from 1972. I say strange because it seems to assume that people with allotments have beehives from which they can source plentiful honey that is required for the many honey-based recipes. 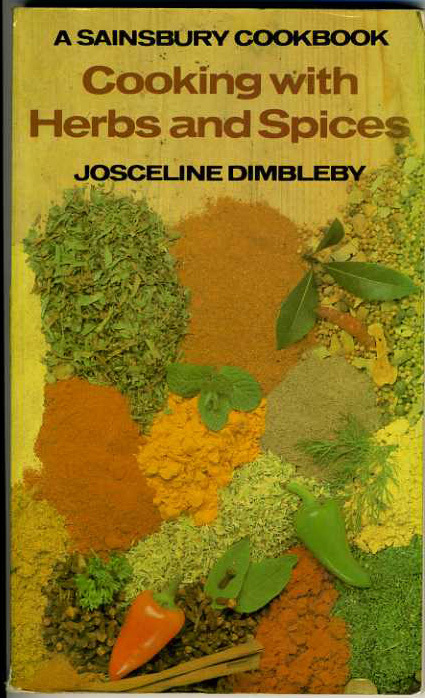 It is also definitively a book for time- and real estate rich, because the diversity of recipes included suggests access to a big allotment and an even bigger amount of time to grow and source and nurse all those flowers, herbs, vegetables and bees required to prepare stuff from this book. A bit of a far cry from the She Quicky Cookbook . Nevermind. After leafing through the book for the umpteenth time to find something that didn’t require me to cook cabbage roses in sugar or trying to figure out what the hell nasturtium is (Editor’s note: this), I chanced upon cobble cakes, a relatively simple affair of butter, sugar, flour and cornflour, baking powder, almonds, candid peel, cinnamon, ground cloves and ginger and rum. As you can see from the pictures below, the recipe calls for icing, but as the whole thing was already quite a sweet affair, I didn’t bother with it. It is an easy recipe that shouldn’t present problems to anyone who knows their way around a food processor. There were a couple of substitutions: unfortunately, I made these cookies just before the start of the consumerismfest season lovely Christmas season, so I couldn’t find candied peel in any of the three supermarkets I came across that day, but I did manage to find a jar of minced meat. I put in a little less than the candied peel required to make up for the increased sweetness. 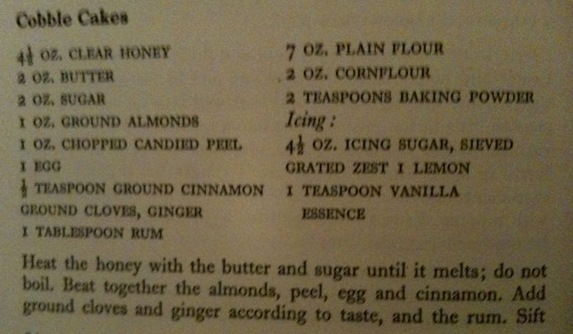 I also had run out of cinnamon and cloves****, but did have ginger and rum. The picture below shows c 25 of the cakes, and although grumpy timer cat seems to disagree, they looked and tasted really quite nice. Their RHKD of 0.6 however indicates that they are nowhere near as moreish as Hussarenkrapferl – they are just a bit too sweet, and you wouldn’t want to eat more than one with a nice cuppa. It may be that the citric flavour of the candid peel makes a difference, so if anyone wants to have a go, let me know your results! ** When she baked them, they looked like perfect little round darling donuts with a dollop of jam nestling in the little hollow that she had made with her dainty thumb. Mine look more like they’ve been steam-rollered by a very small troll living in my oven. Like jammy dodgers then. ***A variation of the formula is n/t/(g+bw), where b is brownness and w the number of weirdo flatmates who prefer darker/burnt cookies, which entices at least one w in my house to increase the rate of decay, but this may be a highly localised variation of the formula and shall therefore be disregarded for future reference. **** AlthoughI think that the sock monster may have a herbal cousin who smokes all the stuff. We usually have at least 5 jars of flavourless cinnamon in the cupboard. I recently bought Mark Kurlansky’s ‘Choice Cuts: a miscellany of food writing’ published by Vintage in 2002 (from the Marie Curie shop on Green Lanes for £1). It’s a 450 page selection, with authors including Pliny the Elder, Ludwig Bemelmans, Wole Soyinka, and M.F.K Fisher (and of course, Jean-Anthelme Brillat-Savarin). Among the 19th and 20th century writers, there is a bias towards female food writers from the U.S. which I think is partly Kurlansky’s effort to boost the reputations of some authors overlooked in favour of European men. It’s full of great recipes in the various sections on meat, carbohydrates, fruit, vegetables and puddings, although I skimmed over some of the more verbose pieces. I decided to only going to cook half of this recipe from 1393’s Le Menagier de Paris (translated by Kurlansky himself, although there’s another version here), as the majority of the steps are concerned with cooking a piece of beef so as to make the cut tough and bloodless (no, thanks – just a medium rare steak is fine). One of the most obvious (and delicious!) 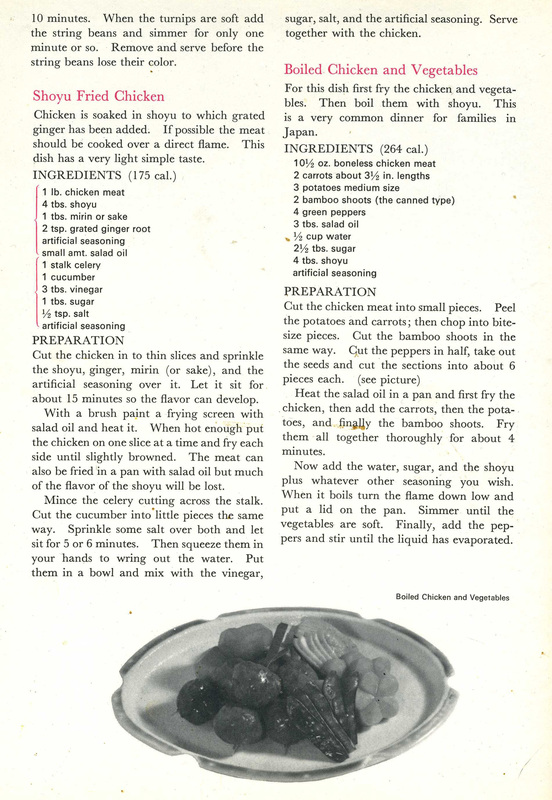 differences between 20th and pre-20th century recipes is the use of spices. Before the advent of the electric fridge, seasonings such as garlic, cumin, cayenne pepper and lemon juice were used liberally, both to preserve food and to disguise the any fetid notes in the flavour. It’s a travesty that this is the first time we’ve made something by the queen of all things aromatic, Claudia Roden (a short bio of whom can be found here), however to me the interesting thing currently about this recipe is what it represents in terms of time and cost. Despite the fact that I really like Indian food, I don’t think I’ve made any Indian recipes for the blog yet, so typically I’ve now done two. The first is chicken curry, Britain’s Most Popular Dinner (according to every arm of the food industry with a finger in the pie of Indian food retail. Wait, hang on…). Hannah Glasse was one of the first famous English women of domestic writing, pre-dating Eliza Acton by almost a century (this is a cracking article about her). 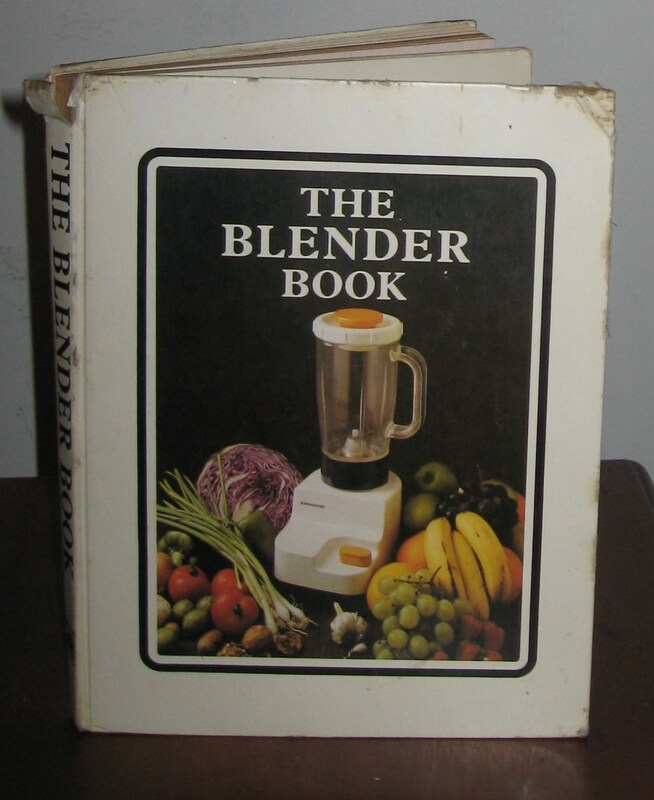 So begins The Blender Book by Gwen Robyns, first published by Hamish Hamilton for Thorn Domestic Appliances in 1971. I’ve made things from this book before, and although it seems a little unassuming they’ve usually turned out ok. I was making dinner for my neighbours and needed something fairly wholesome but filling. This recipe seemed appropriate. I used turkey instead of chicken. Yeah, so basically if it has soy sauce and is fried I want to eat it. Plus meat. This is another from Practical Shoyu Cooking.